Twitter users have used words like 'awesome' and 'amazing' to describe the construction. Beijing's new international airport, yet to start operations, has already taken over the online world. 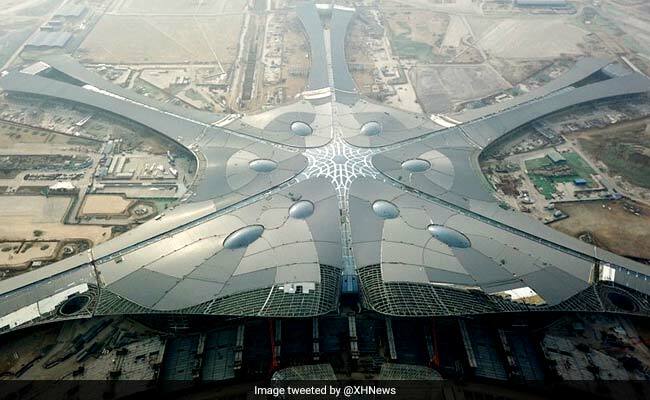 Pictures of the massive airport have flooded social media with some calling the look of the construction 'incredible' and some saying its design has a 'space age influence'. According to Xinhua, the new airport will start test operation come October 2019. With Beijing Capital International Airport being over-crowded, the new airport, located 46 km south of downtown Beijing, is expected to take some pressure off it. The construction of the airport began in December 2014 and is being built at an estimated cost of 80 billion yuan (12.3 billion US dollars), reports CGTN. It is touted to be among the world's largest airports. Spread over 313,000 square meters, the airport terminal buildings will have four runways and will be able to accommodate 620,000 flights every year along with up to 100 million passengers and 4 million tonnes of cargo, reports Xinhua. "It was like a dream but now look like is no longer a dream anymore," says one Twitter user about the construction. "It looks like a device for playing with lights and predict de future," says another. Several others have used words like 'awesome' and 'amazing' to describe the creation. What do you think about the look of the airport. Tell us using the comments section below.